Have you ever wanted to play with a dolphin, swim with a dolphin or have an original painting by a dolphin? At Marineland, you can play and swim with 14 different dolphins, and you can meet their oldest dolphin Nellie (who was born there and is about to celebrate her 60th birthday!) and you can even go to summer camp with the dolphins. Marineland, the oldest marine attraction in the country, is in the town of Marineland, FL. Actually, it is the town of Marineland, Florida. It was built in 1938 as a place to make underwater movies, and where many movies, TV shows and news stories were filmed underwater, including The Creature From The Black Lagoon, Sea Hunt, parts of the original Tarzan movies and Benji Takes a Dive. Marineland was also where the first dolphin birth was caught on film. There were also lots of live shows and exhibits for people to see, and it became a huge destination for families–in fact, their opening day had more visitors than opening day at Disney World! Marineland was built right next to the Atlantic Ocean so it could have access to not only lots of species of fish, but also so they could pump sea water right into the tanks. The original aquariums had windows on the sides so visitors could look into the tank and see the dolphins swimming; it was the first of its kind. Recently, Marineland became a part of the Georgia Aquarium in Atlanta and will work with the aquarium to breed dolphins and help to bring sea life from the ocean to Atlanta. But Marineland is still a place you can touch, swim and paint with dolphins, and they even have camp for kids and teens, trainer for a day and internships that let you interact with dolphins. There are 5 different single-day programs that let you get up close and personal with dolphins: The Touch and Feed program ($29) lets guests spend about 5 to 10 minutes with a dolphin. We did this when we visited in August. 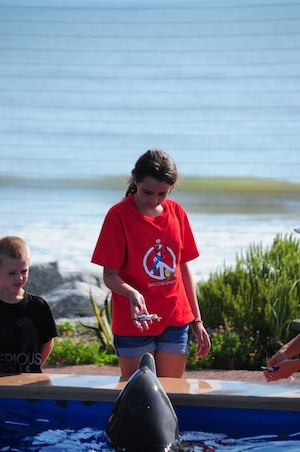 With the help of Dani, a dolphin trainer, we got to know Roxy, a very cute, playful dolphin. First, we got to rub her back, and then Dani had Roxy turn over so we could rub her stomach. I never knew how soft the dolphin’s skin is; it is firm and feels like silk. As we rubbed her we noticed that little bits of her skin rubbed off on our hands. Dani explained that dolphins skin is constantly regenerating, so little bits of it rub off. Next, Dani showed us how to give Roxy hand signals; we waved and Roxy splashed us! Next, we each got to feed Roxy. She eats small frozen fish and swallows them whole. Then, Dani gave Roxy directions to put her tail up out of the water; her nose was pointed to the bottom of the tank. Even though dolphins don’t breathe under water, they can hold their breath a long time. We each got to hold Roxy up out of the water by her tail. It was amazing to feel how strong her tail is; it is made of cartilage, not bone, so it is flexible but strong. Dani showed us the markings on Roxy’s fin; it has little notches in it. Every dolphin has these, she explained, and each is unique, like a finger print. This is how they identify dolphins. Dani showed us another hand signal that sent Roxy swimming around the pool, and with one more splash and a little more rubbing of Roxy’s back, our visit was done. As we left, we saw a few kids playing with dolphins and paint brushes; the dolphins were holding paint brushes in their mouths while the child held a canvas; the dolphin painted a picture (well, a design, really) on the canvas. This program is called Dolphin Designs ($90). If you feel like getting in the water, there are three programs: Discover Dolphins, which lets you go into shallow water and get to know a dolphin for about 20 minutes ($159), the Immersion program, which is the most popular, a 30 minute swim with the dolphins ($209) and Trainer for a Day, which runs from 10 AM to 3PM and after learning to be a trainer, you get to spend an hour training dolphins ($450). 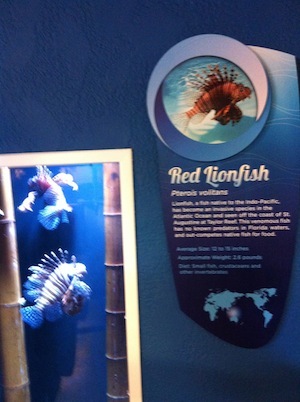 After our Touch and Feed experience we took a Behind the Seas tour. This tour takes you under the tanks, lets you look into windows on the side of the tanks where you can see the dolphins swimming, has photos and memorabilia of the origins of Marineland, and has tanks of local marine life: some of the animals are rescued locally, others are examples of marine life in the local waters, and others are part of Marineland’s aquatic research program. While we were there we saw a few young guests in wheelchairs. Our guide, Kurt, said that Marineland has a lot of special needs guests or guests with disabilities, and they work hard to make the experience great! Many of these guests are children who have a terminal illness or a disability such as autism, and meeting and playing with the dolphins is a great way to learn new things and have a wonderful new experience. Next summer (when Marineland celebrates its 75th anniversary!) 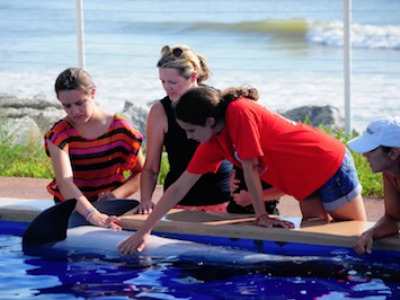 when we go back I hope to swim with the dolphins, but if I can talk my mom into it, I want to go to Marineland’s summer camp: for $499 campers get four full days of learning about dolphins, marine life and conservation, and the last day they get to work with the dolphins. Now that is a great vacation! Disclosure: Tickets to the Dolphin Touch and Feed Experince and the Behind the Seas Tour were provided by Marineland.